Unit 1. Medical and surgical history. Anatomy and pathophysiology of surgical techniques (gastric bypass, sleeve, gastric band, etc.) Schematic diagrams for the different techniques. Unit 2. 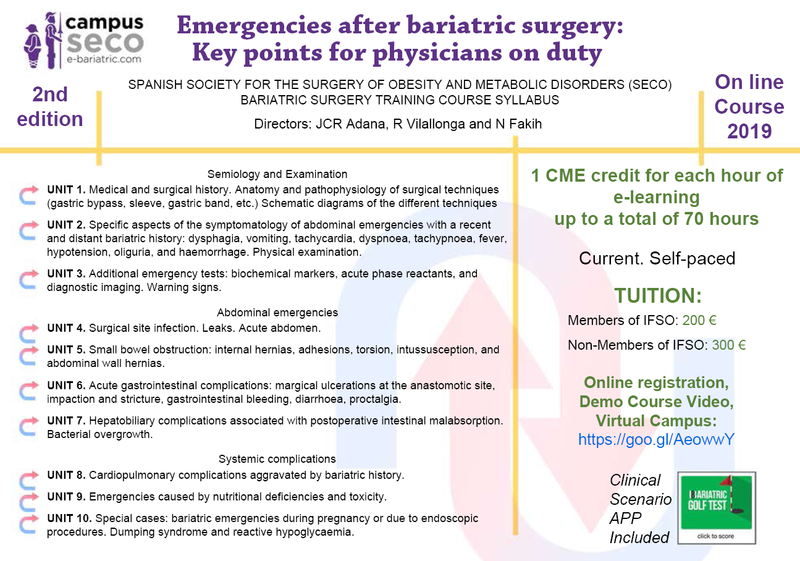 Specific aspects of the symptomatology of abdominal emergencies with a recent and remote bariatric history: dysphagia, vomiting, tachycardia, dyspnoea, tachypnoea, fever, hypotension, oliguria, and haemorrhage. Physical examination. Unit 3. Additional emergency tests: biochemical markers, acute phase reactants, and diagnostic imaging. Warning signs. Unit 4. Surgical site infection. Leaks. Acute abdomen. Unit 5. Small bowel obstruction: internal hernias, adhesions, torsion, intussusception, and abdominal wall hernias. Unit 6. Acute gastrointestinal complications: marginal ulcerations at the anastomotic site, impaction and stricture, gastrointestinal bleeding, diarrhoea, proctalgia. Unit 7. Hepatobiliary complications associated with postoperative intestinal malabsorption. Bacterial overgrowth. Unit 8. Cardiopulmonary complications aggravated by bariatric history. Unit 9. Emergencies caused by nutritional deficiencies and toxicity. Unit 10. Special cases: bariatric emergencies during pregnancy or due to endoscopic procedures. Dumping syndrome and reactive hypoglycaemia.